Real Madrid received the offer for the Portuguese from a Chinese team, Jorge Mendes says. CRISTIANO RONALDO WAS the subject of a massive €300million transfer offer from an unnamed Chinese club, his agent Jorge Mendes has claimed. In addition to reclaiming the title of the world’s most expensive player, the Real Madrid forward could have earned €100m each season by moving to China but had no interest in any switch and turned it down, according to his representative. “From China they have offered €300m to Real Madrid and more than €100m per year to the player,” Mendes said to Sky Italia. 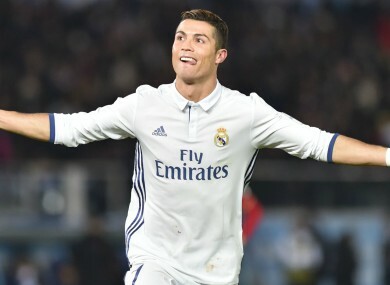 Ronaldo, who this year was awarded his fourth Ballon d’Or crown, signed a new contract with Madrid last month that will tie him to the club until 2021. He has won two Champions League trophies among 10 major titles since signing from Manchester United for £80m in 2009. The Chinese Super League continues to spend huge sums of money, with Carlos Tevez having completed a move to Shanghai Shenhua that reportedly makes him the world’s highest-paid footballer. Chelsea and Brazil attacking midfielder Oscar, meanwhile, will join Shanghai SIPG for a reported £60million when the transfer window opens. Those signings add to the likes of Hulk, Jackson Martinez and Alex Teixeira, all of whom are playing in China after making high-profile moves. Email “Ronaldo subject of €300m bid from China, claims his agent”. Feedback on “Ronaldo subject of €300m bid from China, claims his agent”.